Well it’s not been very long since our last visit to Bath when just a few months ago it was hitting the thirties in centigrade and were swimming in an outdoor pool and languishing lazily in the garden. No time nor inclination to even take a peek into the city despite my love of Bath. This time we are back for what must be at least a sixth time and we are staying bang in the centre to take full advantage of all it has to offer. It’s small but perfectly formed with something for everyone. Me, personally, I’m looking for food (lovely cheese shop) and some retail therapy, or at least some window shopping. We are on a whirlwind tour en route to Devon. It’s a bit too much to do the whole four and a half hours in one with our toddler so a stop in between for a day mooching around Bath and eating dinner in a three AA rosette restaurant seemed hardly a hardship. Given our numerous, previous visits, we have enjoyed staying in a fair few places. All luxury in their own way, all impressive – I do my research and leave nothing to chance! You can’t for a short stay. A bad hotel experience ruins everything. I’d rather stay in the comfort of my own home than be in discomfort somewhere else. Being a little OCD for cleanliness it takes me a while at the best of times to settle in somewhere, so it must live up to my exacting standards! So, to the Queensberry! Right in the centre of Bath, no pushchair needed! Right from the outset I had a good feeling about the place. The reviews of course are great but the website is what really impressed me and made me excited for our imminent stay. This hotel, as they so rightly point out, isn’t like any other. The website is quirky and so it seems is the hotel (in a good way of course!). The description of the hotel and the offering comes from people who know what counts; what guests are really looking for and from the looks of things know that their job is to deliver over and over and over again (more about that later). From the outset one can tell that these guys are professionals both in terms of being the guest and being the hotelier. It’s amazing how things get lost along the way, how hotel management loses sight of what’s important to guests and how to keep them coming back. 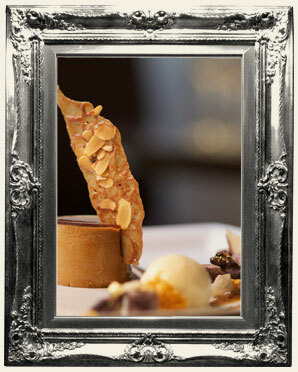 ‘Old-fashioned attitudes to service and details with sophisticated modern comfort..’. Definitely! We pull up outside a beautiful building (well three houses, actually) in a quiet street just steps away from the city centre ( and I mean steps, we are talking 2 mins walk) to be greeted by a well-dressed gentleman ready to take our luggage and valet park the car! Not bad for what is supposed to be a three star hotel! Straight away as we walk in to a hall, beautiful and well-kept contemporary feel, I’m drawn to the drawing room to our left. 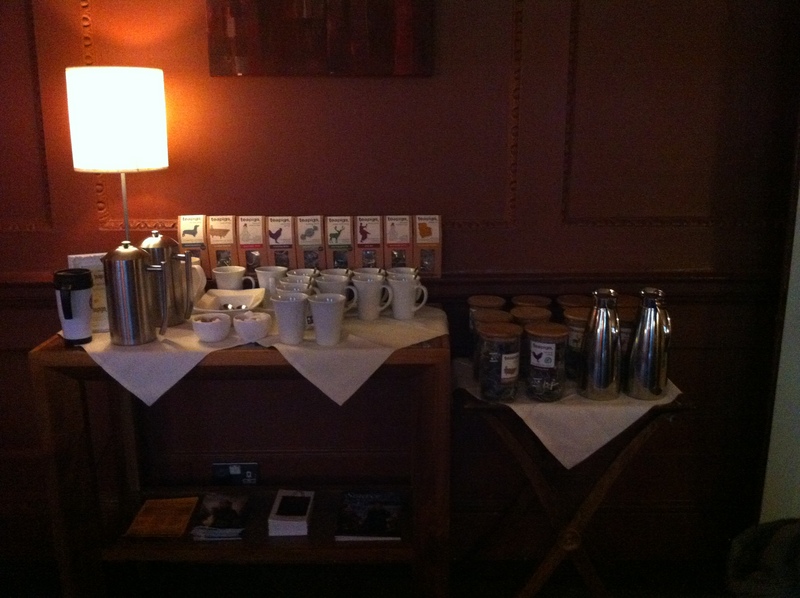 There set out for all guests (free from 8-8) a selection of Tea Pigs. My favourite luxury tea brand. I’m not usually one for free tea and coffee but couldn’t resist a cup of chocolate flake tea. Relaxing already. The hotel is three houses combined together and has staircases going here and there to bedrooms and down to its three AA rosette restaurant ( more later). Unlike many places like this though, the staircases are wide and it’s a joy to explore around each corner. The Q Bar, which is ‘quintessentially British’ is spread over two levels which makes it quirky, cosy, yet it still has a sophistication to it that makes you want to go for a drink before dinner. Once you have tasted the drinks though, you have your reason in itself. Laurence Beere, co-owner of this wonderful hotel is a bit of a connoisseur of rare and unusual tipples and the bar, its menu and its knowledgeable staff all reflect this. For the summer months (and I hope to be back!) there is also a small but perfectly formed, lush green garden where taking a cocktail, I’m sure is a lovely experience! Back to our room. Large would be an understatement. Huge windows looking out on the gorgeous Bath stone buildings in front and down toward the town centre to the left of us. The bathroom again with huge windows and high ceilings was big enough to sleep in. Fluffy robes and quirky, non-run of the mill toiletries welcomed us and a little bed for Alexander (which he did not sleep in, but our bed was big enough, easily for three!). Throughout, you get a true feel of luxury. Everything spotless, by the way and more importantly warm and cosy; it wasn’t a great day for the weather! Many hotels with vast rooms tend to feel cold easily. I have to commend the Queenberry because our heating ( all adjustable from inside the room too) was superb! 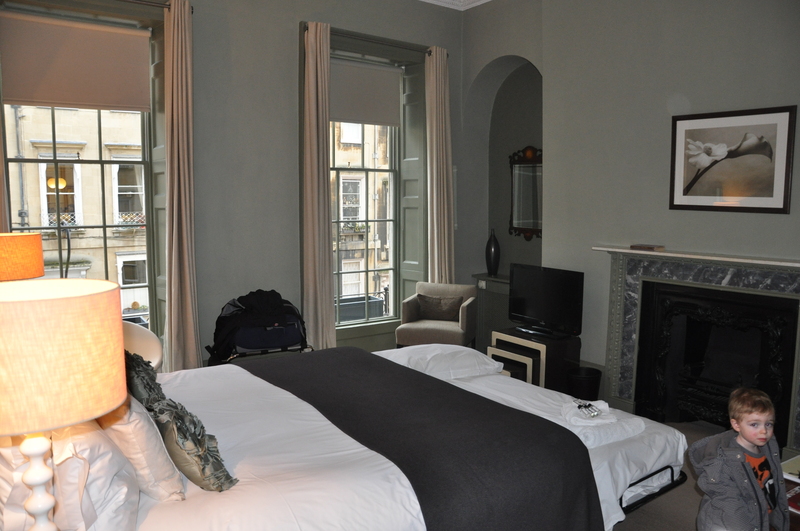 I like everything about this hotel; all that you could need for a city break in one perfectly formed base. We ordered warm milk for Alexander which arrived within minutes, our drinks in the bar were expertly prepared, served with delicious olives and nuts, not the bulk standard selection but ones that you want to eat! I haven’t even moved on to the Olive Tree. The Olive Tree is a destination in itself and we were very lucky to get a reservation at short notice given the accolades and 3 AA rosettes. Indeed we had a two-year old with a very sophisticated palate dine with us. 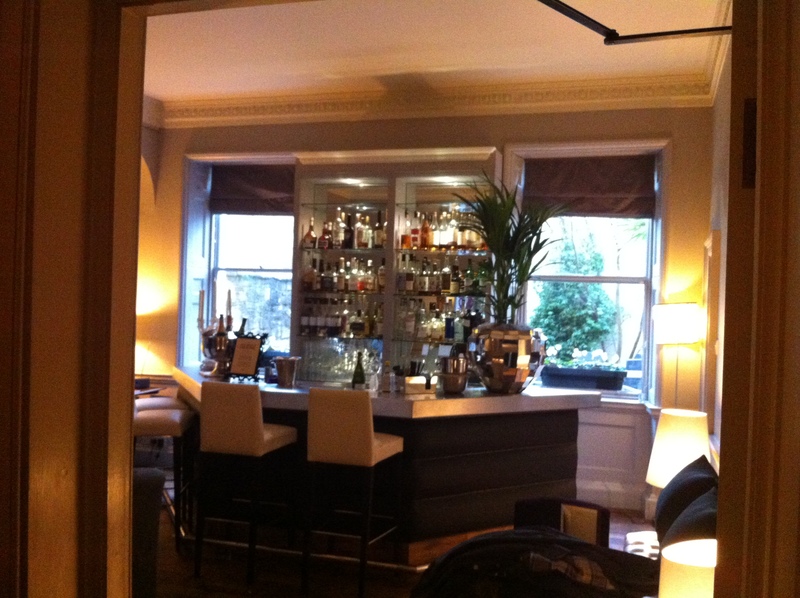 We booked our table for 7pm and ambled downstairs to the cosy yet contemporary Olive Tree. The kitchen under chef Chris Cleghorne and the restaurant under the smooth management of Joss Roussane. As foodies, we couldn’t have asked for more; our perfect choice of restaurant for dinner just downstairs and across from our room. However, one great thing about the way in which they have arranged things is that the restaurant feels like a destination in its own right. You would never know, in the peace and quiet of the hotel drawing room or the quirky bar, that an award-winning restaurant lay beneath you; something quite important, as no matter how good a restaurant, you don’t want to feel like you are there until you actually are! Anyway, seated at our table, Alexander behaving impeccably for once, we start with three very different but equally accomplished dishes. For me it was Loch Duart Salmon which was basically cured and slow-cooked to a melt in the mouth perfection, served with beetroot, horseradish cream and lemon. A perfect taste and texture combination. Mr PCG had scallops with truffled celeriac, apple and celery salad-equally as delicious, and Alexander bravely ordered Chicken and Egg- confit chicken, sage and onion with the ‘cherry’ on top being a wonderfully creamy egg yolk (let’s be honest, I ate half of it- I couldn’t resist!). We then went for venison and chips (thank-you for your understanding, chef! ), partridge with braised chicory, walnut ( what a great flavour addition) and bramley apple compote and the cod. I won’t go into too much detail because a part of the pleasure of eating out is the surprise of discovering the menu for yourself but suffice to say that The Olive Tree is more than worthy of its AA rosettes. They make use of superb quality local ingredients too. Desserts featured ice-cream for Alexander, a stunning lemon curd for me – both sweet and mouthwateringly tangy in perfect measures and a fantastic cinnamon cheesecake. They do offer a full children’s menu but also offered half portions of the main menu which is what we chose purely because it’s nice to broaden the palate of little ones and why deprive them!? A word on the wine list too. We had a glass each of the Hungarian Furmint – a wine that I discovered not so long ago. White, dry and aromatic it’s a rarity to find on a wine list and a pleasure for anyone in the know. The wine list itself is refreshingly ordered according to taste so ‘full, rich, ripe and toasty’ or ‘nutty wines with intense aromas’ – all real ways of describing the flavours and tastes of wine that are easy to understand – perfect. A first class meal, we left sated and ready for a good nights sleep before arriving back downstairs for breakfast, both buffet and cooked that was true to form for a 3 AA rosette restaurant. A real treat in itself! The Quensberry is a gem of a hotel. A real find. A hotel that for its size and lack of swimming pool means that it can’t be a 5* is 5* in every way. It’s small and perfectly formed with every attention to detail made. It is also perfectly placed for visiting Bath. We will be back. I just hope that they have the room!